Get ready to become a mountain-mover! God never intended you to suffer through difficult times. He didn't create you at the mercy of your circumstances, and He isn't allowing bad things to happen to His children. In Moving Mountains With Supernatural Faith, Winston Davenport uncovers the many errors surrounding the topic of faith, and he sheds light on one of Jesus's favorite subjects. Did Jesus say we could command literal mountains to be moved? Where do our mountains come from? Never departing his unapologetic confrontational teaching style, Davenport engages in some sacred-cow tipping and brings clarity to a blurry facet of Christianity. 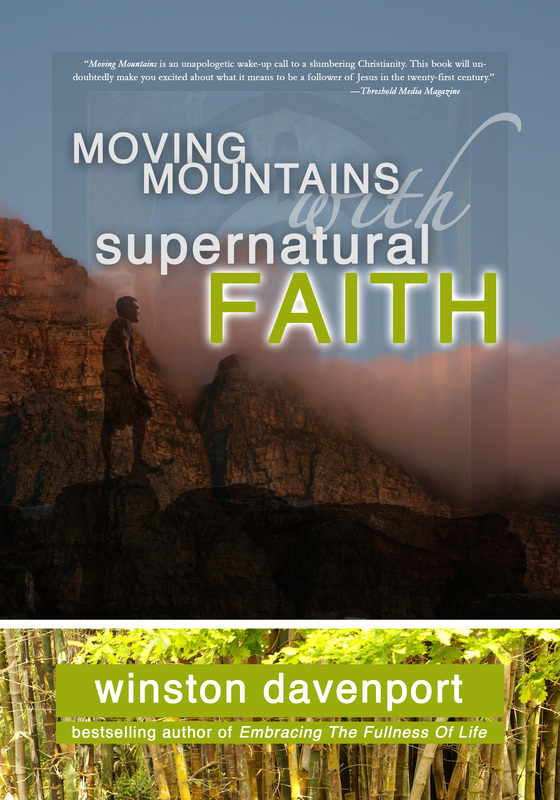 Moving Mountains With Supernatural Faith has become the talk of several Christian magazines and web reviews, and it is sure to leave its mark on modern day Christianity, and certainly on everyone who reads it. When God created the earth, He established various laws. Our entire universe is systematically arranged to operate rigidly and on schedule. Planets are set on specific courses. Earth rotates on a precise axis. The rain falls and waters the earth, then rises back up as a vapor to repeat the cycle. What goes up must come down. For every action, there is an equal and opposite reaction. These laws don’t change according to how we feel on a certain day. They don’t operate at our convenience. If you drop a bowling ball off a high-rise, it will fall fast and hit hard according to the laws of gravity that God set in place. The Law of Gravity has been around as long as the earth. However, Isaac Newton didn’t “discover” it until a few centuries ago. Before the apple fell from the tree and sparked his scientific insight, the Law had already been in operation for thousands of years. People simply had not understood or defined it until that point. There is another law that God set in motion at the beginning of time—it has been in operation since Adam and Eve walked in the Garden of Eden. Few know about it and even fewer consciously live by it. Yet it is one of the most powerful universal laws in existence. It produces awesome results as well as considerable destruction. Many men and women in the Bible were familiar with this powerful law, though none to the extent of Jesus Christ. He explained it to His disciples, but they didn’t fully grasp it. It is repeatedly emphasized throughout the Word of God, but most Christians fail to understand this key principle. People remain victims of themselves, enslaved by their own fears, perishing for a lack of knowledge (see Hosea 4:6). I’m talking about the Law of Faith. It states that whatever you believe will come to pass in your life. The American businessman, the Russian scientist, the Japanese ambassador, and the Buddhist monk are all operating in the Law of Faith, whether they are aware of it or not. The current state of our world is the direct result of man’s collective beliefs. It’s not what a loving God allows to happen; it’s what the people He placed in charge allow to happen. It is an extraordinary fact of life, and yet powerfully destructive in the hands of the ignorant. You see, nothing just happens arbitrarily. Every situation and occurrence in this world is stimulated by what humankind believes, whether or not we are aware of it. In effect, you are transforming your life at this very moment through your beliefs—your faith. If this seems too difficult to believe, consider Jesus’s words about Himself. “And [the Father] has given him the authority, simply because he is the Son of Man, to decide and carry out matters of Judgment” (John 5:27 MSG, emphasis added). For God to operate freely on Earth, He had to be born of man. Why? Because authority on this planet belongs to man. That’s why Scripture refers to Jesus as “the last Adam.” Adam means “man.” All dominion was given to the last Adam just as it was given to the first Adam. The difference is, Jesus didn’t surrender his authority to the devil’s agenda. Satan was present in the Garden of Eden, but he was powerless to touch Adam and Eve. His hands were tied. He knew that his only shot at destruction would come through convincing Adam to do it himself. Adam was the one who had dominion. Satan deceived and Adam believed. Adam, not satan, opened the door to sin on Earth. The devil doesn’t have any more power today than he did back then. The only way he can destroy you is by convincing you to believe his lies. It is still his single most effective trick. Before faith can function in your life, you must recognize this foundational truth: Even though God is ruler over Heaven, He is not in control on Earth. The Bible says, “The heavens are the Lord’s heavens, but the earth has He given to the children of men” (Psalm 115:16). According to the Bible, Earth is outside of God’s jurisdiction! Don’t be. This realization is the foundation for changing your life. The belief that everything happens for a reason is one of the most damaging teachings circulating throughout the Church. Without your active involvement as Christ’s co-laborer, your life will resemble a ship drifting arbitrarily at sea, unproductive to the Kingdom. The belief that God controls everything in our lives is destructive to the faith to which we have been called. Accepting this fact does not threaten or insult God or His sovereignty. As a matter of fact, the most insulting thing you could do is ascribe the evils of this world to God’s will. This notion must be forsaken if you are to become a mountain mover. The derivation of this belief is the need for a temporary sense of relief from disappointment and hurt. Shirking responsibility is the easy way out. That’s why people do it. The doctrine of God’s absolute sovereignty facilitates this attitude effortlessly. However, this passive mindset poisons God’s intent for our participation in carrying out His agenda on Earth. If you’ve been a Christian for even a week, chances are you’ve heard the phrase “God is sovereign” tossed about like cotton candy at the county fair. People use this to mean that everything that occurs was set in motion by God, who is the source of every event. Interestingly, this popular doctrine is not taught in the Bible. The Bible teaches that when God made man, He said he was “very good” and “approved it completely” (see Genesis 1:31). He made us as a gift for His Son Jesus, “That He might present the church to Himself in glorious splendor, without spot or wrinkle or any such things [that she might be holy and faultless]” (Ephesians 5:27). This is not an easy concept to grasp. Paul said, “This mystery is very great” (v. 32). Nevertheless, it is factual and beautiful. We are main characters in a colossal love story. Speaking of His bride, Jesus says, “O my love, how beautiful you are! There is no flaw in you!” (see Song of Solomon 4:7). Many people believe that God made man with a major flaw: the ability to sin. Most will argue that if Adam hadn’t been created with the propensity to sin, he wouldn’t have eaten the forbidden fruit. It is precisely here that God’s concept of perfection dwarfs our own. The crown jewel of man’s perfection in the sight of God is not his inability to sin, but his right to sin if he so chooses. If God had preprogrammed Adam and Eve to choose Him every time, their love would have been completely suspect and therefore imperfect. Allow me to illustrate this principle. Imagine a young man who is searching everywhere for his perfect soul mate—the girl of his dreams. One day he spots her sitting a few tables away in a nice restaurant. She is resplendent in feminine beauty, gently sipping a glass of red wine. The young man has just discovered what he believes will be the satisfaction of his greatest desire. She is refined, confident, and stunning. As he approaches her, striking up conversation, he realizes she is also intelligent, kind, and humorous. As they talk late into the evening, the young man discretely slips a love potion into the girl’s drink. He watches with anticipation as she empties her glass, knowing that in a few moments she will love him too. The potion takes immediate effect. The girl falls madly in love with the boy. They soon marry and neither of them could be happier—at least for a little while. A few months into their marriage, the young man begins to realize that his wife does not truly love him. Oh, she says it often enough, and he knows her words are sincere. However, it is painfully evident that it isn’t her heart declaring her feelings—only the love potion. He realizes that his wife doesn’t love him for who he really is—because of his personality, conversation, or character—for she never chose him of her own accord. Their relationship will crumble because her love is not by choice, but obligation. Would you call this perfect love? In order for God to fully approve of man, the quality of free choice had to be conferred on Adam. Without it, man could not truly choose or love God. The ability to choose means everything to our Father. He even gave it to the angels. His plan wasn’t to fill the earth with robots, or as some Christians suppose, to be pawns on the epic chessboard between Him and satan. He made us like Himself in every way so we could be, as the Scripture says, a suitable companion for His Son. If we were a different kind or species, we could not be partnered with Jesus any more than a monkey could fulfill Adam’s desire for a wife. God made Eve from Adam’s own DNA to be his equal—his own flesh (see Genesis 2:22). This story is likened to God’s creation of mankind. It was not fitting for His Son to be alone. He created us to be a perfect match. He even helped Adam understand this principle by placing a void within him that could only be satisfied by a woman. God explained, “It is not good that man should be alone; I will make a suitable helper for him” (Genesis 2:18 NKJV). Even though Adam had all the animals, none of them were created from his very own side. None were suitable. In the same way, Jesus had all the angels, yet they were not suitable because they were not in His likeness. For this reason, God said, “Let Us [Father, Son, and Holy Spirit] make mankind in Our image, after Our likeness, and let them have complete authority over the fish of the sea, the birds of the air, the [tame] beasts, and over all of the earth, and over everything that creeps upon the earth. So God created man in His own image, in the image and likeness of God He created him; male and female He created them” (Genesis 1:26-27). In the New Testament, James argues that we must abstain from cursing each other because we are made in God’s image and likeness (see James 3:9). There is no doubt about it: God is sovereign! He formed the universe and continues to uphold it by the word of His power (see Hebrews 1:3). He could destroy it in an instant. However, when it comes to His people, He is not as interested in power as He is in partnership. When God created man, He didn’t want to be Ruler or Commander, but to co-labor with us as His children. The very first thing He did after creating man and woman was to empower them with a blessing, saying, “Be fruitful, multiply, and fill the earth, and subdue it, and have dominion” (see Genesis 1:28). This reveals God’s intent for humanity: to rule the earth on His behalf. God enabled Adam to fulfill his calling by giving him power and authority to choose. God wasn’t looking for a crowd of zombies to parade the earth and do His bidding mindlessly. In fact, God wanted to make it so clear that Adam wasn’t being forced or obligated to do His will that He placed a tree in the Garden of Eden and instructed Adam to avoid eating it. If Adam had no other option—no forbidden fruit to taste—he would have been bound to God blindly in the same way that the beautiful young woman knew nothing but “love” for the young man. True love and devotion cannot exist in an environment where free will has been restrained. Adam was presented the ultimate choice—the decision that would define the world. Would he multiply and expand the Garden of Eden according to God’s Word? Or allow the exterior darkness to invade the Garden according to satan’s word? God was not in charge of spreading the Garden; Adam was. Satan had no authority to generate his disastrous intent; Adam did. Both God and satan pled their case, urging Adam and Eve to follow. Yet Adam cast the deciding vote. As you are aware, he made the wrong choice, agreeing with satan and subjecting his God-given dominion to destruction. God’s sovereignty wasn’t compromised, yet He wasn’t in control. It was not God who forced Adam to sin. Rather it was within the perfection of the love-creation that Adam exercised his right of choice, deciding to forsake God’s instruction.